Although I’m a busy gal, I try my best to find time to do a little something special for my friends on their birthdays. My best friend recently turned *ahem* 23, and although I didn’t get to make her a cake or dinner, I offered to have her for brunch and then go shopping. Everything was rather last-minute, but I managed to throw together a decent little spread with what I had on hand. However, I felt like a birthday merited something a bit more special than your run-of-the-mill omelette. Rooting in the fridge, I had a burst of inspiration when I came across some Meyer lemons I’d impulse-purchased the week before- I’d make lemon curd. But what to pair it with? She was coming at 11:00 and time was of the essence. Then it hit me. Crêpes! I could throw the batter in the blender and they’d only take seconds to cook up. 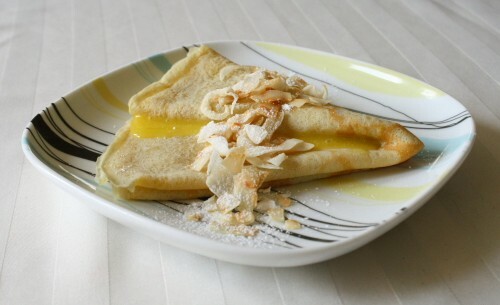 The lemon curd would be used to fill the crêpes. Fabulous idea, but by the time we had eaten our omelettes (and consumed generous amounts of mimosas), we were too full to think about eating anything else. I figured maybe we’d have the crêpes as a post-shopping snack, but we ran short on time. Over the next several days I guiltily ate my way through them, feeling bad that my friend had been deprived of her rightful birthday treat. But even after finishing them off, I still had a fair amount of lemon curd left over. 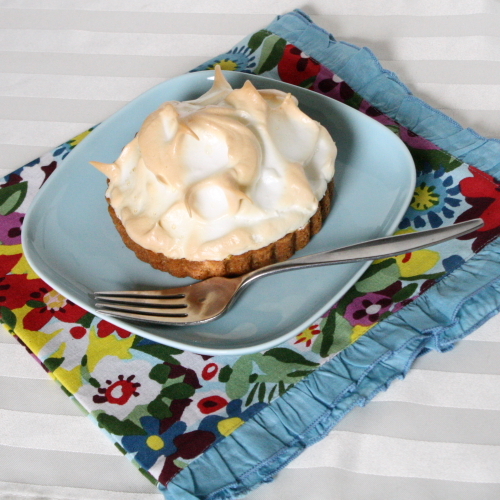 The wheels started churning again… lemon curd, plus the egg whites left over from making the curd, plus graham cracker dough in the freezer from this Daring Bakers challenge= lemon meringue tarts! Better yet, I was meeting up with my friend again that weekend, so I got to deliver her a tart as a belated birthday surprise. I had enough dough and curd to make three individual tarts, so one went to her, one went to another birthday friend (lots of Aries in my crowd!) and the third was eaten greedily by myself and Marvin. A few cooking notes: The graham cracker dough worked beautifully as pie crust. It was slightly challenging to roll out because of the high amount of butter, but I ended up just pressing in into the pans and it was fine. I actually preferred it as pie crust rather than eating it straight as a graham cracker because it’s so rich. The lemon curd I had made was too thin to be pie filling as-is, so I just warmed it on the stove, adding a bit of cornstarch (dissolved first in cold water) to thicken it, and it was perfect. 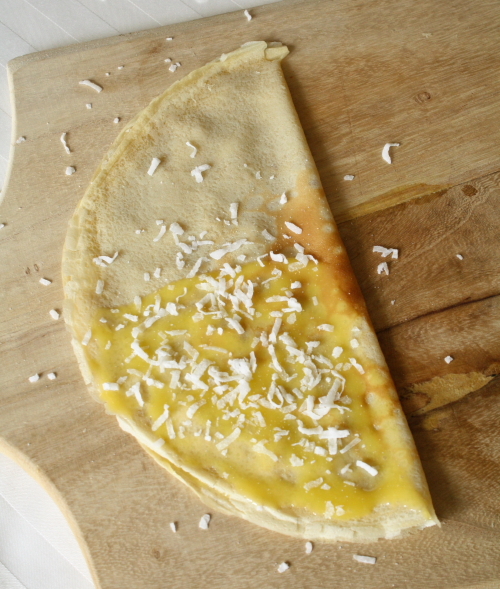 For the crêpes I just smeared it on, throwing in some shredded coconut I had on hand. I’m not going to print a tart recipe here because I kind of pieced together three different recipes and ad-libbed things, but the graham cracker dough recipe can be found in the aforementioned Daring Bakers post. 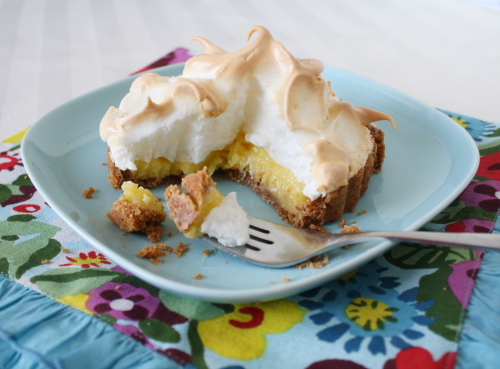 If you want a recipe for lemon meringue pie, my fellow MLFB pal Mom of Mother’s Kitchen just posted one that looks good. 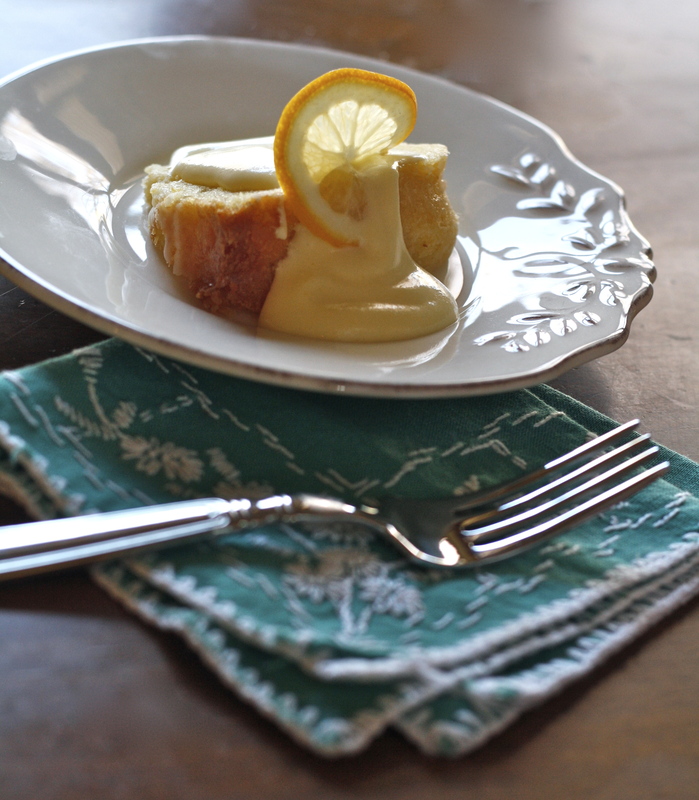 A lemon tangent: I’m still not convinced Meyer lemons are so superior in cooked dishes such as lemon curd, especially given the price difference, but that’s what I had on hand. I will say, though, that they seem to yield a higher amount of juice than Eurekas so you can use less of them. Also, as another update to last year’s lemon post, my preserved lemons turned out great, I still have a supply in the fridge that I’ve been working my way through slowly. 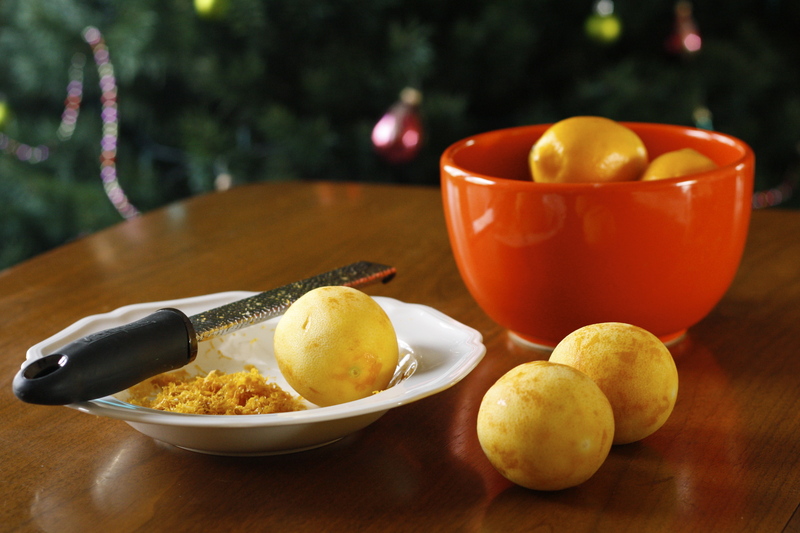 I’m glad I didn’t use Meyers for those as some recipes suggest, because the part you use is the skin, and the skin on Meyer lemons is so thin that you wouldn’t end up with much of anything to use. Heat a nonstick crêpe pan* or skillet over medium-high heat. Gently stir the batter (it likely will have separated). When hot, lightly butter the pan (the best method I”ve found is to quickly go over the surface with a stick of butter). Lift the pan a few inches off the burner and pour just enough batter to coat the pan, quickly tilting and rotating it to distribute the batter. The volume of batter will obviously depend on the size of your pan but try to use the least amount possible while still coating the pan. (This recipe recommends ¼ cup for a 9-10″ pan.) 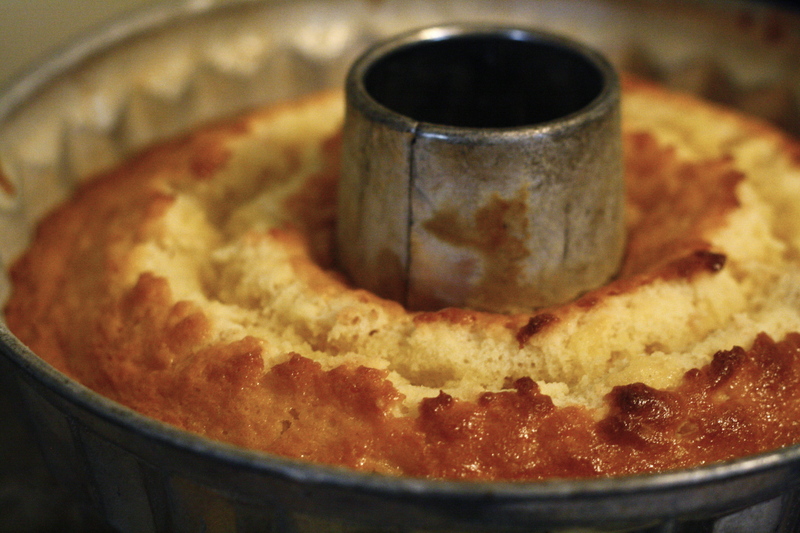 If there are “holes” around the edges you can dribble a little more batter in those spots with a spoon. Cook until the crêpe is just set (about 1 minute), then flip and cook until golden- this should only take another 15-30 seconds. I use my fingers to grab the edge of the crepe and flip it, I find it much easier than trying to use a spatula, but if you’re doing this just be careful not to burn yourself! 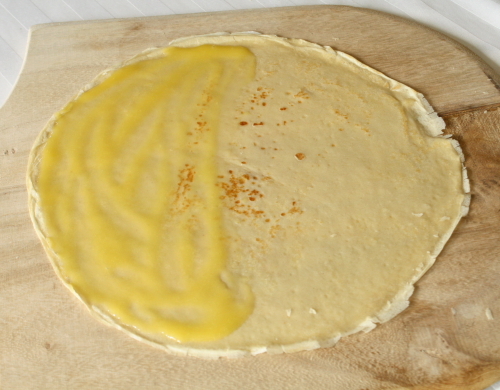 Set the crêpes aside on a cookie sheet s you go, keeping them covered with a tea towel or piece of foil. 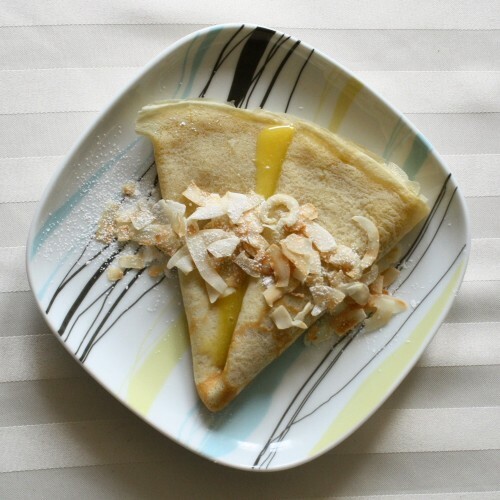 When assembling, you want the crêpes to be warm but not so hot that they melt the lemon curd and make it too runny. *I own this crêpe pan and I like it. I also use it to make omelettes; the low sides make it really easy to flip / roll the omelette. Place all ingredients in a heavy-bottomed saucepan. 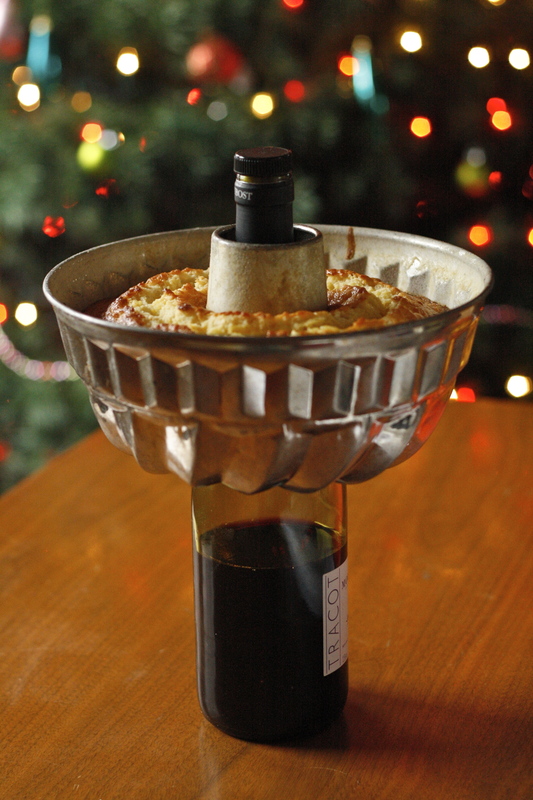 Use a whisk to break up the eggs and moisten the sugar. Put the pan over medium-low heat and stir constantly until the mixture thickens (Dorie says 4-6 minutes but mine always seem to take longer). The curd is done when you can run your finger down a spoon or spatula and the curd doesn’t run into the track you’ve created. Don’t worry if it looks thin, it will firm up as it cools. Place plastic wrap on the surface of the curd and refrigerate. The curd will keep, refrigerated, for up to 2 months. Makes about 1 ½ cups. Oh my poor little neglected blog! I haven’t really been any busier than usual; maybe I’m just going through a little slump. I’ve still been cooking, but it’s been pretty utilitarian- soup and chili to get me through the week; a roasted chicken with some veg and risotto over the weekend. 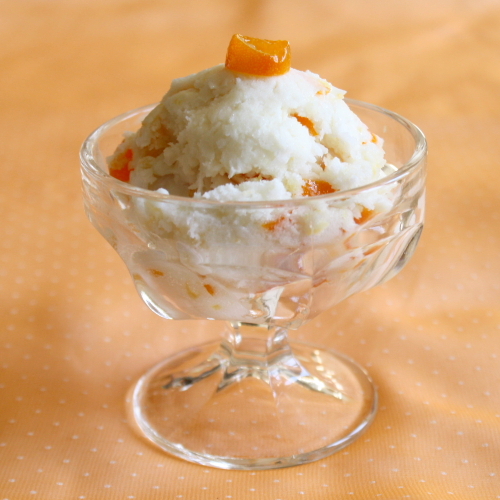 I did make one “superfluous” thing, though- this really quick kumquat and coconut sorbet. In my effort to try to take advantage of seasonal items while they’re around, I picked up a pint of kumquats at Trader Joe’s, without any clear idea what I was going to do with them. I decided to candy them, which I’d done before and knew was a breeze… but then what? Ice cream was an obvious answer; ever since I got my ice cream maker I’ve been using it whenever I have fruit I’m not sure what else to do with (see my posts on blood orange sorbet and Meyer lemon sherbet…). I just wanted something quick and easy, so instead of making a custard as you would for ice cream, I just used coconut cream and the sugar syrup from candying the kumquats to make a sorbet. The bonus is that it was vegan so I could serve it to a couple vegan friends who came by. So, without further ado, here’s the recipe. Grab a pint of kumquats while they’re still in season and whip up a batch this weekend! 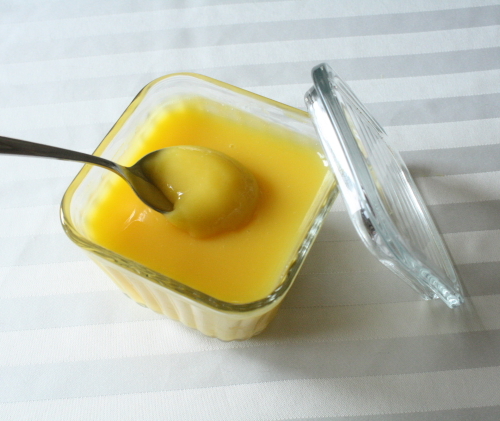 Note: for non-vegans, you can add a teaspoon of gelatin for a smoother, less icy texture; just dissolve it in 2 Tbs water in a small saucepan over low heat; when fully dissolved (no visible graininess), add it to the sorbet base before putting it in the refrigerator. 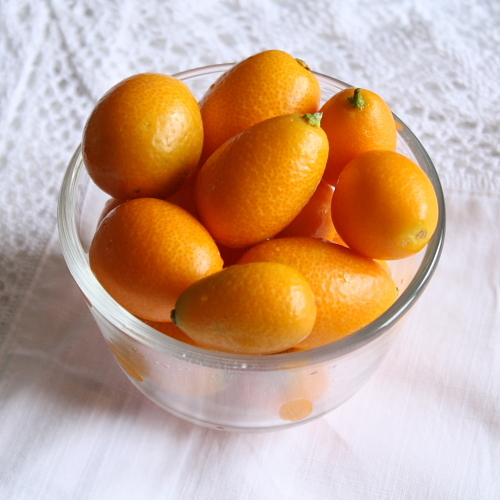 Wash the kumquats and slice into 1/8″ slices, removing the seeds. Put the sugar and water in a small saucepan over low heat. When the sugar has dissolved, add the kumquats and bring to a very gentle simmer for about 10 minutes or until kumquats are tender. Put the coconut cream and rum in a bowl. 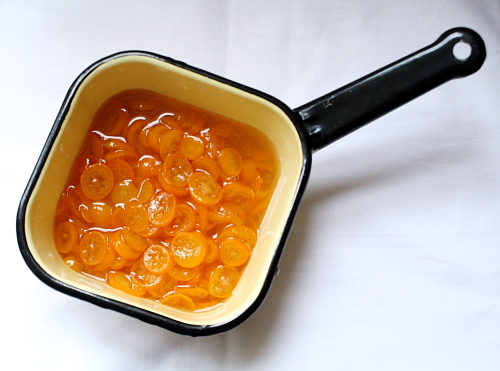 Strain the kumquats over the bowl, pressing down with the back of a spoon. Stir the coconut cream and syrup to combine and place in the fridge until cool. Chop the kumquats and set aside. If you wish, you can reserve some of the kumquat rings for garnish. Remove the coconut cream/ syrup mixture from the fridge, giving it a whisk to combine and stir out any solidified bits of coconut cream. Freeze according to your ice cream maker’s directions. When the base is frozen but still semisoft, stir in the kumquats and coconut, if using, and transfer to a container. Place in the freezer until firm. Makes about 1 quart. I’m not a huge cheesecake fan- it’s not that I dislike it; it just wouldn’t be my first choice for empty calories (just give me the cheese plate instead! )- but I figured I would kill two birds with one stone and use it as my contribution to Easter dinner at Marvin’s mom’s house. Turns out, his family all LOVES cheesecake- so much so that there were at two other cheesecakes at the get-together. At least mine was the only one with lemons! The recipe itself was pretty darn easy, mainly just combining ingredients in a bowl and dumping them in the pan. And fortunately I didn’t have any issues with waterlogged crust or a crack in the top. I thought this was a good albeit very rich recipe. There was no flour (is there usually flour in cheesecake? I have no idea. I thought maybe there was a little), so the consistency was very soft and not at all “cake-y”, and it got kind of melty at room temperature, but was much better chilled. The consistency may have changed a little due to my adaptation as well. To flavor the cheesecake, I substituted 1/4 cup marmalade for 1/4 cup of the sugar, added the Microplaned zest of one lemon, and substituted lemon juice for the liqueur (too bad I didn’t have any Limoncello on hand!). You’d think it would have turned out ultra-lemony, but it was actually pretty subtle. The candied lemons on top were what really gave it some kick; I liked how their slightly bitter bite offset the sweetness and richness. Incidentally, we had a great time at the family get-together, where we played a spirited game of Cranium with his cousins, and ate WAY too much food. I’m still working through some of the leftovers! In addition to ham AND turkey, there was a delicious pork and bean dish with three kinds of pork, the ubiquitous arroz con gandules (this is the Puerto Rican side of the family), homemade grape leaves (a remnant of his mom’s marriage to his Chaldean father), several other side dishes, and about 15 different desserts including flan (which I polished off for breakfast with some banana and strawberries). One of these days I am going to get together with his mom and learn some of the traditional recipes. Meanwhile, I’m happy to bring my contributions, and was relieved at not having a whole cheesecake sitting around my house. Unfortunately, I forgot to take my camera to Easter, so I only have the few photos I took before we left. The photo of the cheesecake without the pan and the pics below of me photographing the cheesecake are courtesy of Marvin. The last couple weekends A few weeks ago, I went just a little nuts with the citrus. I wanted to make sure to take advantage of it before the season is over, so I made no less than four different things out of lemons. I’m calling it my “Midwest citrusfest”. It’s finally starting to warm up here, but the lemons were a much-needed burst of sunshine while we wait for the real thing. There’s a condiment I’d been wanting to make for a couple years now and never got around to, but I have no idea why, because the “recipe” is simplicity itself: just lemons and salt. I’m referring, of course, to Moroccan preserved lemons. I looked at several sets of instructions, and they were virtually identical: cut the lemon in quarters, but don’t cut all the way through; stuff the lemon with as much salt as it will hold (measurements were given, but unnecessarily so, in my opinion); reshape the lemons and stuff them in a jar. Some of the recipes said to add additional lemon juice to cover, but others said it was fine to wait a few days; by then, the lemons should release enough of their own juice. So now I have a big jar of lemons in some liquid that is starting to take on a slightly viscous, mucus-like appearance. I’m hoping this is normal. I have to wait another 2 weeks or so before they’re ready, at which time I plan to make the classic tagine of chicken with preserved lemons and green olives. Hopefully I will not perish due to botulism or some other form of food poisoning. Although I cannot imagine any living thing surviving the amount of salt I used. Ever since my sister gave me the Cuisinart ice cream maker for Christmas, I’ve been whipping up lots of frozen treats. Fruit ices and sorbets are the easiest because you don’t have to do a custard base. I still had lemons left, so next up was a batch of Meyer lemon sherbet. 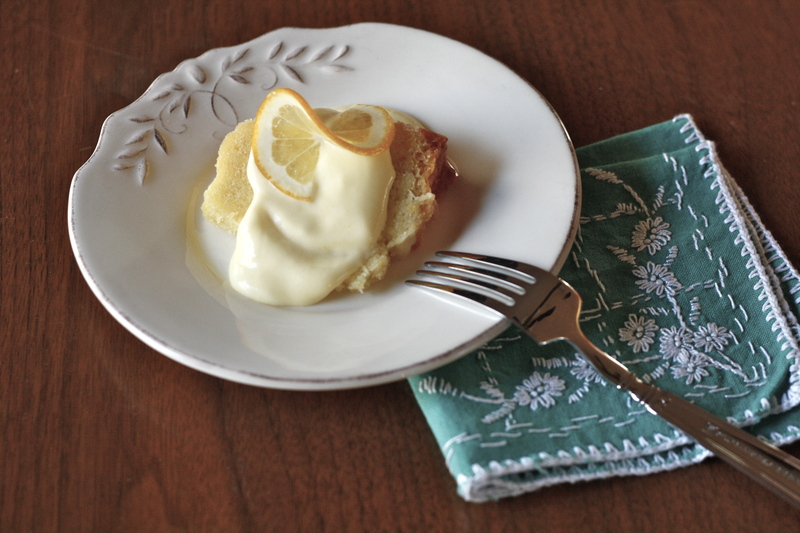 I have to pause here and question all the foodie love for Meyer lemons. I honestly was hard-pressed to taste a difference between the sherbet I made with Meyers, and any other standard lemon ice. With the marmalade I get it, because regular lemons would have too thick a skin for marmalade. And the Meyers are pretty juicy, but for the difference in price, I’m just not sold. Perhaps I need to taste them in a lemonade, or a lemon curd, to fully appreciate their superiority… Anyone else with me on this one, or are my taste buds just not that sophisticated? Supposedly they’re sweeter than regular lemons, but if you’re adding a bunch of sugar to a recipe, what’s the difference? In any event, the sherbet tasted like lemons, so I was happy. 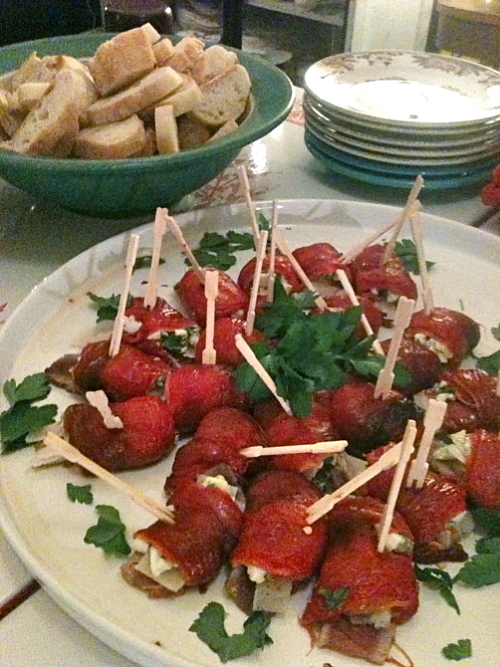 I used a recipe out of Chez Panisse Fruit and adapted it a bit- see recipe below. The last thing I made with my remaining lemons was candied lemon slices. These were also utilised in my Daring Bakers challenge. I used the instructions found here; the only variation I made was to strain and save the syrup in which the lemons are cooked, rather than discarding it. You can use this syrup in cocktails where simple syrup is called for (as long as the lemon flavor won’t clash), or to sweeten iced tea, or to make lemonade. Or muddle some mint, add the syrup and some club soda for a nice refreshing bevvie for your teetotaler friends. I’ve already used mine to drizzle over some berries, to sweeten a smoothie, and for a couple other things including the sherbet recipe below. I enjoyed my midwest citrusfest, but am definitely looking forward to the fruits of summer! Directions: Combine syrup, juice, zest and milk. (Don’t worry if milk looks a little curdly; it will be fine once frozen.) Gently heat gelatin mixture until fully dissolved and no longer grainy. Add to other ingredients and refrigerate until cold; then freeze according to the directions of your ice cream maker. *Note: for those not wanting to use gelatin, you could add a tbs or two of some sort of alcohol (vodka or limoncello, perhaps?) as an anti-freezing agent, or try using half-and-half instead of milk.